7in. 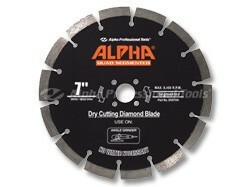 Alpha Segmented Quad Diamond Blade - Max. RPM: 8,400 RPM. Arbor: 20mm Quad Drive. Flush Cutting Application for Granite Alpha Professional Tools recognized the need for a 7Ã¯Â¿Â½Ã›Â segmented blade for flush cutting applications. We designed this blade to work on 7Ã¯Â¿Â½Ã›Â angle grinders commonly used in various applications within the stone industry. Ideally suited for flush cutting applications such as 90 degree corners, the Alpha Quad Segmented Blade provides an aggressive segmented style cutting action with the convenience and life of a direct sintered blade, whether it is used wet or dry. Monumentalists will appreciate the versatility of this blade and love its aggressiveness. 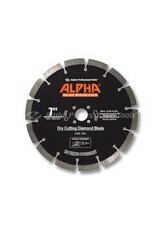 Fabricators and tile contractors will find the Alpha Quad Segmented Blade an excellent choice. This versatile blade is very adaptable for a wide range of cutting applications such as bevels, checks, rabbets and washes. It features extra tall 1/2Ã¯Â¿Â½Ã›Â segments for long life and superior performance. The Alpha Quad Adapter provides an extra measure of safety. The Alpha Quad Segmented Blade surpasses any of the competition for ability and longevity.